Local HOG Chapters allow people who share a passion for Harley-Davidson® motorcycles to come together. The Salem HOG Chapter provides members with plenty of opportunities to meet with friends, have fun, support worthy causes, and ride. Full membership is for owners of Harley-Davidson motorcycles only. Just provide your VIN. Associate memberships are available for family members of a full member. Interested in membership? Submit an online membership interest form for more information and a personal invitation to join our chapter! 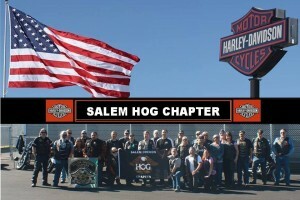 The Salem HOG Chapter meets on the fourth Tuesday each month. February & March 2019 meetings will be at Salem Harley-Davidson,3601 Silverton Rd NE Salem, Oregon 97305. The meet and greet (formally meeting) will start at 6:00 P.M. and finish up at 8:00 P.M. We will have two food trucks, games, and more . The Salem HOG Chapter is sponsored by Salem Harley-Davidson. * Members of either of these sister HOG Chapters may attend the meetings of one or both HOG Chapters. Salem Harley-Davidson is the local dealership in Salem, Oregon, for Harley-Davidson® motorcycles, parts, accessories, MotorClothes® merchandise, T-Shirts, collectibles, great service and friendly staff! Their extensive expertise in financing programs is second to none! Salem Harley-Davidson is located at 3601 Silverton Rd. NE, Salem, OR 97305, Phone: 503-363-0634. See their website at www.salemharley.com. We installed a Comodo SSL certificate for your safety. Always look for the green bar and/or lock in your browser’s URL bar before entering credit card or personal information on a website.